Update 6/15/2010: In two days, I'm going to go get my silkies! Catdance put an ad in Craigslist for four chicks and I was the first to respond, plus she's selling me a fifth silkie that's the same age. YES! Tomorrow I'm going to go out for bedding and DE (I bought feed and vitamin/electrolyte today, but forgot bedding and didn't think I needed a 50 lb bag of diatomaceous earth). 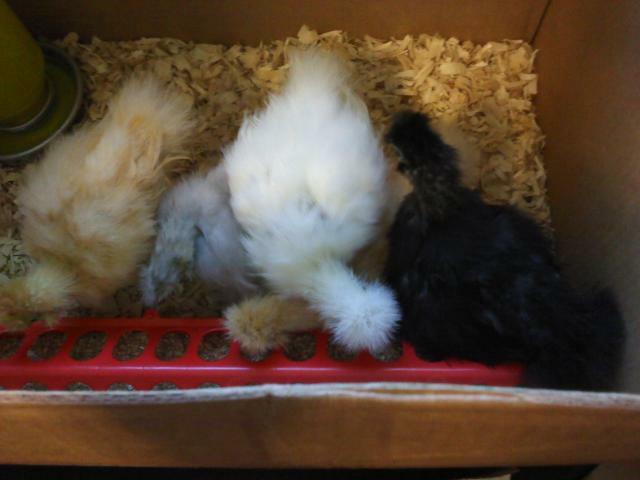 Thursday I get back from work, grab a tupperware of watermelon and a bag of bedding, and head up to Washington with my boyfriend to get five six-week-old chicks: two buffs, a white, a black/lavender split, and a blue splash. I just got out of my university apartments and moved onto a 50-acre farm in Unincorporated Washington County, Oregon (Hillsboro area). While I don't have any chickens yet, I desperately want to raise them! I'm trying to find a free coop, as that seems to be the most expensive start-up cost of raising chickens. I only want a small flock to start off, and scan the pages of Craigslist and Freecycle a few times a day (ok, more or less constantly). I don't really trust my carpentry... ah, "skills." We have coyotes, small snakes, opossum, raccoons, owls, and hawks out here, after all. The breeds I'm most interested in are standard silkies, buckeyes, and easter eggers. I'd like to raise heritage breeds or endangered ones, but silkies are my current priority (they look like chocobos, large riding birds from a video game) as my friends and boyfriend are all nerds. Plus, from what I've read, they seem to be very sweet birds. Really, though, I'm up for just about anything! Too bad I don't have the safe space or equipment for a brooder. Currently, I share the house with two women, a man, two dogs, and four cats (hence why I can't get chicks). All of the animals are very predatory. We share the land with four horses and two ponies, not to mention the deer, quail, snakes, raccoons, coyotes, owls, hawks, and whatever else comes roaming around our place. It's a pretty great little place, and I can hardly wait to get started!